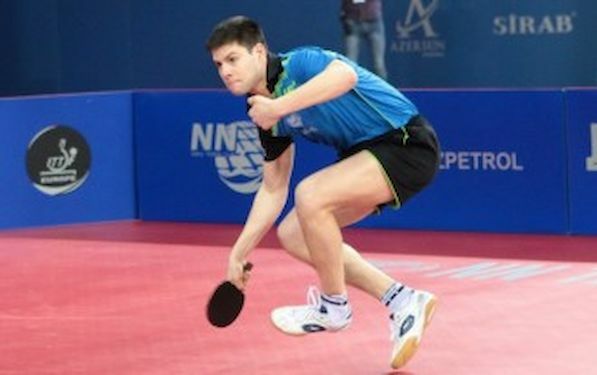 After Lyon 2012, Dimitrij OVTCHAROV of Germany repeated the success at the 2015 NN Table Tennis Club ITTF – Europe Top 16. In knife-edge final he beat last year’s champion Marcos FREITAS of Portugal. In final Dimitrij was 3:1 down before he recovered to win the match. “Actually I was not so bad. I was in the lead in first game, but when I lost it, it gave advantage to FREITAS. I had a set ball later….However Marcos played very good today and I had to give my best. It was especially hard after match in the semi final against Panagiotis. The main task for me was to calm down and to prepare myself for final,” said OVTCHAROV. Panagiotis GIONIS booked his place for the World Cup after victory over Simon GAUZY of France in seven games in the match for bronze. “Our first goal was to reach quarterfinal, but when I saw the draw and APOLONIA was there, I thought I can go further. I won and of course instantly start thinking of World Cup. I am so happy that I will leave Baku with that ticket,” said GIONIS. However the umpires did not see that, but after OVTCHAROV stopped, they gave the point to GIONIS. Players agreed it was double ball and GIONIS returned the point to OVTCHAROV for 5:5. Alongside that point, he lost his focus and soon it was 8:5 and 11:8. “I won my games easily and each set GIONIS won was very close. He played perfectly and seized each and every opportunity occurs,” said OVTCHAROV. Men’s standing:1.Dimitrij OVTCHAROV GER; 2. Macos FREITAS POR; 3. Panagiotis GIONIS GRE; 4.Simon GAUZY FRA; 5. Tiago APOLONIA POR; 6. Robert GARDOS AUT; 7. Adrien MATTENET FRA; 8. Joao MONTEIRO POR; 9/12 Par GERELL SWE, Kristian KARLSSON SWE, Vladimir SAMSONOV BLR, Paul DRINKHALL ENG; 13/16 Andrej GACINA CRO, Steffen MENGEL GER, Bastian STEGER GER, Farhad ISMAYLOV AZE.